Of all the pre-made Commander decks, this one inspired me as the best one to customize and truly go nuts with. 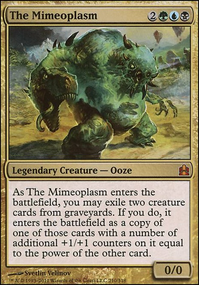 The Mimeoplasm rewards players able to think on their feet and improvise, because there is no end to the wild combinations the game makes available, especially in multiplayer Commander games. Of course, I can't just rely on my opponents to provide all the interesting ammunition, so I've added several of my own special touches. I really don't know what else to say about the deck. So many plays just end with "MWAHAHAAA", and it makes the deck an absolute blast to play. It's too bad that can't come across very well in solo playtests, since it's also rather dependent on interactions with the opponents, but hopefully this list will give you some idea of what's going on. Holy crap! The recording Chewie and I submitted to CMDR Decks a million years ago is today's featured video on GatheringMagic.com!